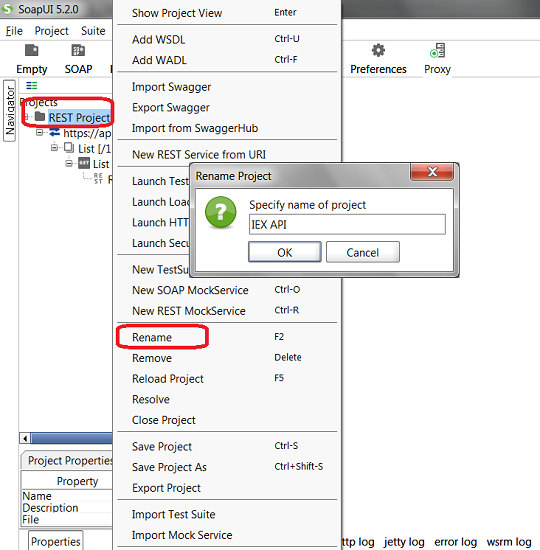 How to rename project objects in SoapUI? When you create new SoapUI objects, their names might be set to default names like: Project 1, TestSuite 1, Request 1, etc. If you don't like those names, you can change them as shown in this tutorial. 3. Right-mouse click on "REST Project 1" and select "Rename" from the context menu. 4. Enter a new name like "IEX API" in the "Rename Project" dialog box. 5. Click "OK" to confirm the change.